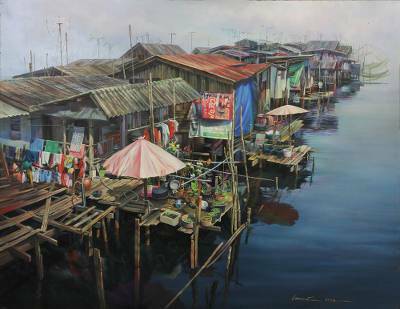 Houses on stilts rise above the river where the residents' lifestyle revolves around the water. Merchants and fishermen inhabit these busy homes in Southern Thailand. Working in lucid oils, Seksan Sing-on takes an evocative mood as he details boats, grey clouds and the quiet, glassy stream. "My artistic style is realistic…. My works usually blend the beauty of nature and my own personality." "My name is Seksan Sing-on. I was born in a farming family on May 28, 1977 in northeast Thailand. I'm the second child of four; my father was a teacher, and we also grow rice. Everybody in my family likes drawing. In primary school, I often helped my teacher with drawings for class presentations, such as charts or maps. I finally decided to study art and graduated with a university degree. "Now I work as teacher for a vocational school. I teach my students and I also paint, which makes me very happy. In fact, I'd like to paint full time, because it requires absolute concentration, however for financial reasons and the responsibility I feel toward my students I decided to continue teaching. "My artistic style is realistic. Before I create a painting, I first think about it until I'm sure that it will be a good one. After that, I start working. My works usually blend the beauty of nature and my own personality. That's simple and goes well together. "Since I began studying, many times I won awards in state or royal art competitions. I don't yet have my own gallery, but one of my friends currently does. So, my work is often displayed there. "Today e-commerce, like Novica, is ideal for distributing products worldwide. It's helpful and simple for the artisans to present their own work widely and meet new people around the world." We ordered Seksan Sing-on's beautiful watercolor ""Differential Soul"" and are absolutely thrilled with our purchase. Seksan Sing-on's technique is exquisite; we plan on hanging the painting above our fireplace where it will grace our living room. We wish we could tell the artist how much we enjoy his work and look forward to seeing more of his watercolors on the Novica site in the future!